Singer, record producer, lyricist, and now actress - there is nothing that Mariah Carey can't do. Whatever she touches, turns to gold; whatever she sings, sells platinum. Going completely against her glamorous image, she played a 'simple' social worker in Precious, and has already won accolades for her performance. Ganesha feels that the Supporting Actress of the Year award at Capri's Hollywood International Film Festival is the first of many awards that are lined up for her during this year. Ganesha uses Indian Vedic Astrology's Dasha Bhukti System and VarshPhala method (Tajaka System) to predict her fate during 2010. Ganesha observes that Mariah is currently under the influence of Gemini Ascendant and exalted Venus in the 10th House. Venus in Pisces along with debilitated Mercury (in the same sign) creates Neech Bhang Raj Yoga. It is to be noted that Mercury is her Ascendant Lord. Venus is the significator of arts and Mercury signifies communication. Both are placed with Sun, the planet that signifies fame. As Midheaven (10th House) of her chart is so well influenced by Sun, Mercury and Venus, she was born to be popular. From 3rd January to 25th January, 2010, she will be under Venus major period, Sun sub-period and Mars sub-sub-period. Mars is swagruhi in the 11th House of gains. So during this period she is bound to achieve some fame, some financial gain or may also receive acknowledgement for her performance. Period from 5th July to 26th August, 2010 is also equally favourable, so during this period she will remain in the limelight. 16th September to 16th November, 2010 is the period during which Venus major period, sub-period of Sun and sub-sub-period of Venus will operate. During this period, she may give some record-breaking hit songs. Ganesha observes that Transiting Jupiter will enter the 10th House of fame and success in Mariah's chart in first week of May 2010. This transit of Jupiter (through Pisces) is going to be highly beneficial for her. Her fame will increase mani-fold and she may also receive some awards after the specified date. Since transiting Jupiter is in her favour, so she has scope of winning awards during the entire 2010. Saturn and Rahu Ketu's transit is going to be a little difficult for her as far as domestic and personal relationships are concerned. Saturn is transiting through the 4th House and Rahu-Ketu are transiting through 7th House - 1st House axis. In this case, she will have to be extra careful of her public image and see to it that someone doesn't try to tarnish it. On the domestic front, she may not be able to live up to her expectations due to some restrictions or health issues and mood swings. But it'll be still enough for her to gain fame due to Jupiter's transit. 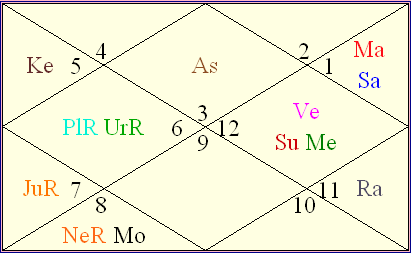 Tajaka System's Varshphala chart casted for her birthday in 2009 shows an exalted but retrograde Venus along with Mercury and Sun in the 11th House (of gains), which indicates a financially progressive time till next birthday. Muntha was in the fifth House. The fifth House indicates performance and children both. In her Natal chart, retrograde Jupiter is in the fifth House (Karako Bhaav Nashay rule applies), which makes brings down chances of having kids. So Muntha's position in the fifth House during 2009 has given a boost to her performance, but didn't bless her with any kids. 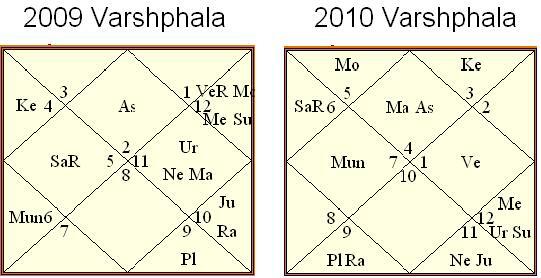 In 2010's Varshaphala chart (chart that would operate from her birthday in 2010), she will have Venus in the 10th House in Aries. This is a potent configuration as per Ganesha's view. She will take initiative to do something radically different. Mars, the lord of fifth House of the Varshaphala chart, is debilitated. So chances of having kids in the year 2010 are also ruled out. Due to Ketu's position in the 12th House, she may be inclined towards spirituality after her birthday in 2010. Alternatively, she will get into some noble deeds. In short, Mariah would keep rocking the world and her best time is still to come.